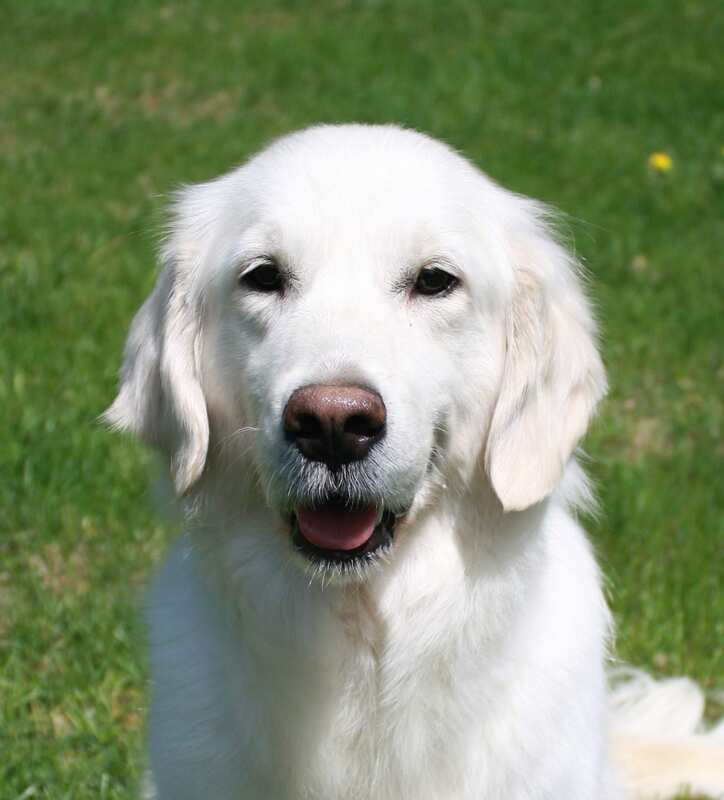 Bailey #5142 - Yankee Golden Retriever Rescue, Inc.
Bailey was about 2 years old when a kind-hearted Samaritan took her in. Bailey was not well cared for, and once this individual met her, she could not leave Bailey in her current situation. 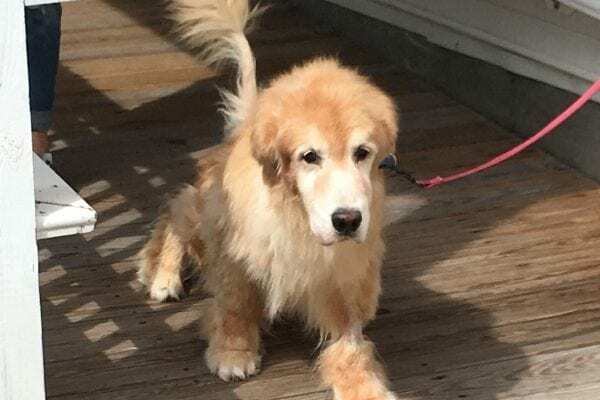 Although she intended for her family to give Bailey a loving home, she soon discovered that Bailey had many more issues than she had anticipated. Bailey was very timid and was not housetrained, despite her age. Of much graver concern, however, was the fact that Bailey was not a healthy girl. Besides being infested with hookworm and whipworm, Bailey was heartworm positive – a death sentence if expensive treatment is not provided. Wanting Bailey to get the care she needed, the family immediately called YGRR. Bailey was quickly admitted and brought straight to our veterinarian. We treated her hookworm and whipworm, as well as Lyme disease. Bailey immediately began to feel better as these health conditions came under control. We also bathed her, then bathed her again, and then bathed her yet again! Poor Bailey should have had a white coat, but hers was yellow and brown when she first arrived, discolored by laying in urine and filth all day long. It took weeks for her true color to finally emerge. While preparing to start Bailey’s heartworm treatment, we also began work on her housetraining and teaching her to walk on leash. Her progress was slow because she didn’t have a lot of self-confidence, but it was very rewarding to see her sweet personality start to shine through. Finally Bailey was ready to have her heartworm treated. The treatment for heartworm is dangerous for the dog. As the worms die off, the dog must be kept as quiet as possible. If the dog gets too active or excited, the dead worms can clot and cause a potentially deadly embolism. We kept a very close eye on Bailey, and she came through her treatments with flying colors! We then scheduled her to be spayed. Once she had recovered, she was finally ready to go to her forever home! Bailey now lives in the most loving home imaginable with her adopter and “big” sister Daisy, YGRR #4791 (although Daisy is slightly older, both girls are only about 50 pounds!). These two little girls are like peas in a pod – they love to play or just hang around together. Bailey was very afraid to go for walks when she first arrived, but she soon followed Daisy’s lead and has now made lots of friends in her new neighborhood! Daisy also showed her how to make calf eyes at the vet so that the staff hands out plenty of cookie-bones! Bailey’s adopter is very vigilant in continuing Bailey’s housetraining, as well. As a result, Bailey has not had an accident in her new home. It was a long journey, but Bailey is now part of a loving home where she will always get the care and attention she needs! Bailey thanks you for your support. Thanks to the generosity of our supporters, we were able to tend to Bailey’s physical and emotional well-being. For the first time in her life, Bailey now knows what it is like to be cherished as a true family member. This happy ending would not be possible without you! Bailey and all the Rescue dogs send big wags and kisses your way!